What changes make the 2018 Toyota 4Runner different? New accessory packages dress up this old-school SUV as it soldiers on as the only surviving midsize utility vehicle with body-on-frame construction. Last redesigned for model-year 2010 – an eternity ago in the car business – the ’18 4Runner returns as a midsize four-door with optional seating for up to seven. Its roster includes plush leather-lined models, but its core identity is as one of the few remaining midsize sport-utility vehicles to employ traditional engineering in the service of serious off-road ability. The 2018 4Runner’s six-model roster is unaltered. It reprises base SR5 trim and ascends through SR5 Premium and Limited grades. It also encompasses a trio of hard-core, go-anywhere models under the “Toyota Racing Development” banner: TRD Off-Road, TRD Off-Road Premium, and TRD Off-Road Pro. Every ’18 4Runner shares a V-6 engine and five-speed automatic transmission. The SR5, Premium, and Limited are available with a choice of rear-wheel drive or four-wheel drive (4WD); the TRD models are 4WD only. Note that the GX from Toyota’s premium Lexus division is essentially a super-luxury version of the 4Runner, with more conservative styling and a V-8 engine in place of the V-6. New for the 2018 4Runner is the Wilderness Package, an option available on all but the TRD Off-Road Pro model. It adds crossbars to the already-standard roof-rack side rails and includes all-weather floor liners and a handy slide-out cargo-floor tray. Also new for 2018 is the TRD Enhancement Package. It’s available on the TRD Off-Road and TRD Off-Road Premium and includes TRD matte-gray alloy wheels in the standard 17-inch diameter, plus a TRD stamped aluminum front skid plate. For the 2018 TRD Pro, Toyota adds three new color choices: Super White, Midnight Black and the exclusive Calvary Blue. Because you like its looks and layout, capabilities and image — and understand the advantages and disadvantages of its truck-like build. Today’s 4Runner is the fifth generation of an SUV originally introduced in 1984. It isn’t a crossover but is instead one of a dying breed: a midsize SUV with traditional truck-type construction in which body and frame are attached as separate units. A decade ago, this was the SUV norm, with 4Runner competing against truck-type designs such as the Ford Explorer, Nissan Pathfinder, and Dodge Durango. But as it became apparent most buyers didn’t exploit the towing or off-road brawn inherent in this trucky construction, automakers began to build essentially tall-wagon versions of their cars. They used car-type engineering that unifies body and chassis as a single structure. Lighter in weight, better-handling, more space-efficient, and easier on gas, these “unibody” utility vehicles are called crossovers. They’re the industry’s fastest-growing vehicle segment. Over time, some midsize body-on-frame SUVs, such as the Chevrolet TrailBlazer, Isuzu Trooper, and the funky Toyota FJ Cruiser were retired. Others, including Explorer, Pathfinder, and Durango, morphed into crossovers. With demise of the Nissan Xterra in 2016, 4Runner is the only choice in an old-school SUV that isn’t the compact-class Jeep Wrangler, a full-size model, such as the Chevrolet Tahoe, or a high-priced specialty item, like the Lexus GX or Toyota’s own Land Cruiser. Sometimes being alone has its advantages. Toyota sold some 74,000 4Runners though the first seven months of 2017, a 15 percent increase over the same period 2016 and ahead of midsize crossovers such as the Durango, Honda Pilot, Hyundai Santa Fe, and Nissan Pathfinder and Murano. Yes, if you’re willing to gamble on a possible styling facelift or, more important, if you think Toyota might extend to the 4Runner various safety features common to its cars and crossovers. In size and basic engineering, the ’19 4Runner is apt to be a virtual repeat of the ’18, updated only with new color choices and perhaps another fresh options group or two. It’s almost certain to cost more than the 2018 4Runner, though. A minor styling facelift is in the cards before the next full redesign; the most recent was for model-year 2014. Appearance tweaks to nose and tail could happen for 2019; seeing if you like any changes may be one reason to wait. Toyota would better serve 4Runner buyers, however, by at least offering them elements of the Toyota Safety Sense-P. This laudable suite of driver-assistance features is fast becoming standard on most all Toyotas. It contains adaptive cruise control to maintain a set following distance; autonomous emergency braking with pedestrian detection; lane-departure warning with automatic steering correction; and automatic high-beam headlight control. None of these features is available on the current 4Runner. 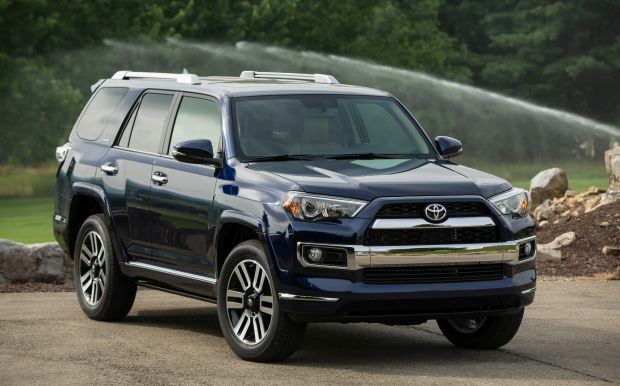 If the automaker doesn’t provide at least some components of Toyota Safety Sense-P before 4Runner’s next full redesign, it should at the least make the ’19 available with blind-spot and rear cross-traffic detection. It’s conceivable even Toyota doesn’t have a firm release target for the next all-new 4Runner. Although fast approaching status as the oldest vehicle design of any type, reports suggest 4Runner’s continued popularity means Toyota is in no rush to spend millions on a redesigned. In fact, industry journal Automotive News doesn’t expect an all-new 4Runner before at least model-year 2021 or ’22. Potentially influencing Toyota’s timetable for a facelift or redesign is Ford’s planned 2020 revival of its body-on-frame Bronco as off-road-ready competition for the Wrangler and potentially the 4Runner. Is the 2018 styling different? Just the subtle changes introduced by the Wilderness and TRD Enhanced packages or the TRD Pro’s new colors. Otherwise 4Runner remains proudly boxy with bulging headlights and taillamps and a gaping grille that can look brightly upscale on the Limited or black-ops belligerent on the TRD Pro. The Limited has more exterior brightwork than the other models and is the only 4Runner with 20-inch alloy wheels. The others have 17-inch alloys; they’re black-accented on the TRD Off-Road and Off-Road Premium models, while the TRD Pro has its own matte-black TRD alloy wheels wearing knobby Nitto Terra Grappler all-terrain tires. It also comes with the stamped-aluminum front skid plate. All TRD models also have a hood scoop, and all 4Runners except the base SR5 come with heated power mirrors with turn-signal indicators. The 4Runner is about as long overall as its crossover rivals but has a shorter wheelbase (distance between front and rear axles), which can benefit off-road maneuverability but also reduces the size of the rear door openings, to the detriment of entry and exit. It’s also taller than anything else in the class. That’s partly a product of a high-riding chassis that contributes to the 4WD models’ generous 9.6-inch ground clearance but adds to the challenge of climbing into the passenger compartment or loading heavy cargo. The cabin design is as blocky as the exterior, almost industrial in feel and featuring oversized dials and controls. Premium-tier models upgrade from fabric upholstery to Toyota’s convincing SofTex synthetic leather. Limiteds come with tony perforated leather and faux-wood trim. TRD versions feature a carbon fiber-patterned center console. All models come with a leather-wrapped tilt/telescope steering wheel. The view out the upright cabin is commanding. The seats feel substantial and headroom and legroom are good for five adults. Available on SR5 and Limited models, the 50/50 split/folding third-row seat is an afterthought, useful mainly for hauling small kids on short trips. Ordering it brings an entry-aiding sliding feature for the second-row bench and extends head-protecting curtain side airbag protection to all three rows. It’s costs $805 on the SR5, $1,085 on the SofTex-upholstered SR5 Premium, and $1,395 on the leathered Limited. Extra volume provided by that tall roof boosts cargo space to above average for the class, although the modest body length limits it to just 9 cubic feet with the third row seat deployed. Otherwise, there’s 46.3 cubic feet behind the 40/20/40 split second row bench and 89.7 with it folded. A backlight that powers into and out of the liftgate is a very cool class exclusive, aiding both ventilation and cargo versatility. Also useful is the aforementioned cargo tray, which supports up to 440 pounds. A $350 accessory as a stand-alone option, it slides in and out coup le of feet to ease luggage loading and is perfect as a tailgating table. None. The ’18 4Runner reprises a powertrain formula well suited to its function as an off-road SUV but less successful to its mission as an on-road wagon. 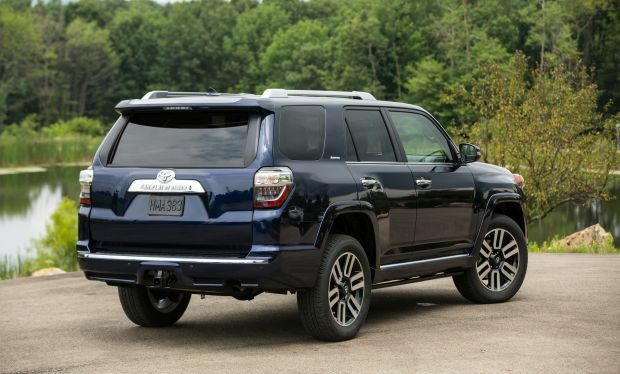 The latter assignment is complicated by 4Runner’s decidedly un-aerodynamic shape and its weight: at around 4,800 pounds with 4WD, it’s among the heaviest vehicles in the class. Muscle is merely midpack, however. With 270 horsepower and 278 pound-feet of torque, the 4.0-liter V-6 is fine in undemanding driving. But ask it to hustle onto a freeway or past slower traffic, or burden it with passengers and cargo and point it up a long mountain pass, and you’ll want for more power. Adding to the unrapid response, Toyota saddles the 4Runner with the only five-speed automatic transmission in the segment. Top rivals have automatics with a minimum of six speeds, some have eight speeds. Happily, things are different off road, where 4Runner’s rugged build and focused 4WD systems help even the non-TRD models feel formidable. Three setups are on tap, all with low-range gearing for maximum traction on severe terrain. SR5 models have part-time 4WD, which requires driver activation and should not be left engaged on dry pavement. Limiteds have a full-time 4WD that can be left engaged on dry pavement and, like the part-time system, includes downhill assist that automatically limits vehicle speed to a controllable walking pace on steep downgrades. TRD models also have part-time 4WD, but it’s augmented by a traction-increasing electronic locking rear differential and by Toyota’s Multi-Terrain Select system. The latter gives the driver overhead-console controls that customize the drivetrain for a range of surfaces, such as rock, mud, or sand. The switches also engage these models’ standard Crawl Control, essentially low-speed off-road cruise control; it has five selectable speed settings and works in forward and reverse. TRD Pro versions get brutally serious with unique TRD-tuned front springs and Bilstein high-performance shock absorbers that help it exploit its knobby tires. The only real threat to 4Runner’s off-road prowess in this segment is the Jeep Grand Cherokee, a crossover that ably defends its brand’s go-anywhere reputation, especially in TRD-rivalling Trailhawk trim. The GMC Acadia All Terrain is also especially capable. On road, 4Runners reflect old-school body-on-frame driving manners, with relatively sluggish steering response, lazy reactions in quick changes of direction, and more body lean in corners than any crossover allows. Still, there’s a friendly, unhurried feel to it all, and Toyota gives Limited models its X-REAS shock absorbers that adjust automatically to reduce body lean. That’s also a function of Toyota’s Kinetic Dynamic Suspension System, a $1,750 TRD-model option, although it also allows extended wheel travel off road. A bit of body-on-frame isolation, compliant suspensions, and tall-sidewall tires help give every 4Runner a pleasantly comfortable ride. Don’t expect crossover-like isolation from wind noise at highway speeds – a tradeoff for the shape of 4Runner’s grille and body. And blame the TRD Pro’s tire tread for elevated road rumble on pavement. EPA ratings for the 2018 4Runner weren’t released in time for this review, but with no relevant changes to this SUV, they should repeat the model-year 2017 numbers. That means 4Runner would remain a backmarker in a midsize utility-vehicle segment dominated by lighter, more aerodynamic crossovers. Rear-drive versions of the 2017 4Runners rated 17/21/18 mpg city/highway/combined and 4WD models 17/20/18. Only the aforementioned Wilderness and TRD Enhancement packages. And we’ve already addressed Toyota’s decision to again deny 4Runner buyers the latest collision-mitigation systems, particularly autonomous emergency braking. But there certainly is no shortage of comfort and convenience features, in addition to the hardware and software dedicated to off-road performance. All 2018 4Runners include as standard underbody skid plates, fog lamps, a backup camera, and a 6.1-inch dashboard infotainment touchscreen. In addition to its SofTex upholstery, the SR5 Premium and Off-Road Premium models add heated front seats, power moonroof, and an automatic-dimming rearview mirror. The TRD Pro comes with automatic headlamps. In addition to its leather upholstery, the Limited includes heated and cooled power front seats with driver’s-seat memory, dual-zone automatic climate control, keyless entry with pushbutton start, power-extending and retracting running boards, and front and rear audible parking assists. A power moonroof is standard on the Limited and an $850 option for the SR5 Premium and Off-Road Premium models. On the infotainment front, SR5 and TRD Off-Road models come with Toyota’s Entune system that includes support for in-dash navigation through a smartphone via the Connected Navigation Scout GPS Link App. Also standard is a USB 2.0 port with iPod control, Bluetooth phone and audio streaming, Siri Eyes Free connectivity, and satellite radio. Since GPS apps don’t always furnish real-time navigation in the absence of a cell signal, credit Toyota with making imbedded navigation a reasonable $345 add-on for the SR5 and TRD models and standard on the Limited. SR5 Premium, TRD Off-Road Premium, and TRD Pro also get an upgraded audio system, while Limited goes further with a JBL setup and a subwoofer. Base-price range is $35,405-$45,705, marginally higher than most midsize crossovers, although selected rivals offer near-luxury variants that breach $50K. The 4Runner is one of the few North American-market vehicles Toyota sources from Japan, as opposed to the United States or Canada, making its pricing a bit more sensitive to fluctuations in currency values. Base prices include Toyota’s $995 destination fee. The 2018 4Runner SR5 starts at $35,405 with rear-wheel drive and $37,280 with 4WD. Base price for the 2018 SR5 Premium is $37,235 with rear-drive and $39,110 with 4WD. Base price for the ’18 Limited is $43,720 and $45,705, respectively. Base prices are $38,530 for the 2018 4Runner TRD Off-Road model, $40,490 for the TRD Off-Road Premium, and $43,670 for the TRD Off-Road Pro. Release date for the 2018 Toyota 4Runner was August 16, 2017.